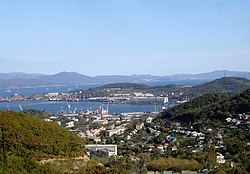 Nakhodka (Roushie: Находка) is a port ceety in Primorsky Krai, Roushie, locatit on the Trudny Peninsula juttin intae the Nakhodka Bay o the Sea o Japan, aboot 85 kilometers (53 mi) east o Vladivostok, the admeenistrative center o the krai. Population: 159,719 (2010 Census); 148,826 (2002 Census); 160,056 (1989 Census). ↑ http://www.nakhodka-city.ru/user_page_content.aspx?UPageID=228; date retrieved: 7 Dizember 2011.